For the more adventurous type, take a beautiful trip into the high country of the Sierras, inside the Ansel Adams Wilderness for a visit to Mono Hot Spring Resort. On the South fork of the San Joaquin River, partake in endless hiking, swimming, fishing and soaking surrounded by scenery that brings complete inner harmony. Mono Hot Springs touts that they are the alternative destination to Yosemite for a memorable family vacation. Reservations must be made in advance. Mono Hot Springs is a seasonal destination. Enjoy a hot mineral soak in the austere stone bathhouse or outside in the hot spa. Jetted streams of natures best will wipe away the sore muscles from a day of outdoor adventures as you gaze upon mountain views feeling peace seep into your bones. More than twenty rustic cabins are available for a good night’s rest. Most cabins are constructed of native cobblestone, adding to the atmosphere of relaxation and the beauty of nature. Some cabins are equipped with cooking areas and sleep from 2 – 5 guests. There are also a variety of tent-cabins to choose from for a bit closer to nature feel. Full use of all hot spring facilities is included in overnight rates. 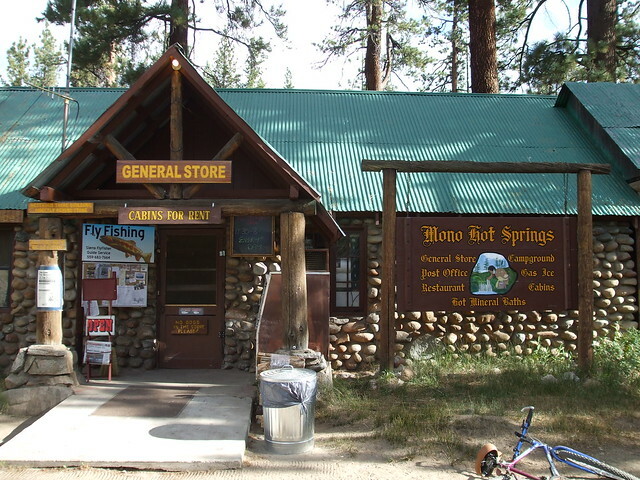 Fine dining in the wild can be found at Mono Hot Springs Restaurant, along with a convenient, quaint General store for breakfast and all of your other necessities. WiFi is available, and the store has a cell phone for emergency use. Rejuvenating massages are available by appointment to further enhance the relaxation experience. From Huntington Lake: Get ready for a wild, beautiful, scenic drive! Top off the gas tank and head up the hill on FSR 80, Kaiser Pass road. Enjoy the five miles of two-lane pavement before hitting a one lane road for twelve more miles, but don’t worry, it’s pavement all the way. One mile past the High Sierra Ranger Station you’ll find the turnoff to Edison Lake and Mono Hot Springs. If you like a rugged resort with very friendly people, you would feel right at home. On the other side of the San Joaquin River from the resort, are all of the natural Hot Springs. The Hot Springs themselves are on national Forest land and technically are clothing optional. Although do be considerate of those who were there first. Best times of year to go are the spring and fall. There are several tubs along the river ranging from 95° to 106°.